As gamers, we talk a lot about a game that emulates a Choose Your Own Adventure book, meaning that our choices will lead us down variable paths to variable endings. In those children’s books from the ’80s and ’90s, only a few endings were pretty good endings and the rest usually ended with the main character dying some horrific death. Video games are often inspired from these classic books, but not many truly follow that formula. After all, who really wants to play a game for 25-plus hours where there’s a 75% chance that your decisions will end in a terrible death? Psycho-Pass: Mandatory Happiness proves that such a game is possible, even with low chances for a good ending (even less for a true ending), and it does so by keeping the story almost as short as one of the CYOA books would be. It only takes about 3-4 hours to complete one possible story, and you will not want to end your time with it after that one playthrough or even two. You’ll even be, dare I say, happy to see all possible endings. Psycho-Pass: Mandatory Happiness is set in the world of the Psycho-Pass anime, but with two new characters created specifically for this tale. Players can choose to play as either Nadeshiko Kugatachi or Takuma Tsurugi. Both characters are part of the whole story, but depending on who you choose changes the point of view, which parts of the backstory are told, and, of course, which choices can be made. Nadeshiko is an Inspector for the Public Safety Bureau, and Takuma is an Enforcer, and both have very different roles, giving the player various insights into their stories as well as the underlying plot. The world of Psycho-Pass takes place in a futuristic Japan, where technology has determined that the best way to keep order in a society is to profile everyone’s mental state and disposition. With the Big Brother-like Sibyl System, everyone’s emotions and thoughts are run through it and the corresponding metrics are known as one’s Psycho-Pass. The Pass contains a person’s Hue, which is one’s stress level. The goal is to always keep your Hue clear and keep it from being cloudy for too long. Obviously grief and anger will temporarily make a Hue cloudy, but authorities will be triggered if it stays cloudy to the point that Sibyl deems the person is a risk to society. In addition to Hue, the Psycho-Pass also has a Crime Coefficient, a number that represents that person’s criminal capacity. If the number is too high, the Public Safety Bureau (PSB) will send in detective teams of Inspectors and Enforcers to determine if the person needs to be enforced. Enforced can mean a wide variety of things, from killing the perpetrator to knocking them unconscious with the Dominator weapon and sending them to a hospital for rehabilitation. In a too long, didn’t read version—this future society uses a computer to place numbers and colors upon people that display their stress levels and propensity to commit a crime. It’s very much Brave New World meets Minority Report, and it’s just as creepy. Those who already watch the anime will be right on board and ready to dive on in. No matter which character you choose, you’ll learn that right before Nadeshiko became an Inspector, she has lost all of her memories. Despite this, Sibyl has declared that she is fit as an Inspector, ready to tackle criminal investigations. She also seems to be rather devoid of all emotion and is logical to the point of being almost robotic. Takuma, in contrast, is a very emotional being. He agreed to become an Enforcer to find a childhood friend of his who suddenly disappeared. Right after they start their new jobs at the Criminal Investigations Department, they are thrown into a series of strange cases that appear to be manipulated all by the same person. A boy who calls himself Alpha has decided that he is the one who will bring happiness to those who have cloudy Hues and borderline Crime Coefficients. The problem is, he doesn’t take into consideration that one person’s happiness could be at the detriment of another’s. For instance, in the first case, Alpha reunites childhood friends who were separated by Sibyl determining that the girl, Shiori, needed to go to a school in Tokyo instead of her hometown. Shiori is delighted to see her old friend, but since the only way he will be happy is if she’s with him, he kidnaps her with Alpha’s help. Needless to say, Shiori is not happy. As the story goes on, the cases become wilder and emotions run high as Nadeshiko and Takuma work together to figure out who Alpha is and why he is imposing his idea of mandatory happiness. We joke about pressing “X” to win, but in this situation, it’s so very true. The only “gameplay” (a term I say quite loosely) is pressing X to select a choice or move the dialogue along. No matter where I thought potential “gameplay” would come in, I was wrong each time. When NIS America calls this a visual novel, they are not joking. The player watches plenty of cut scenes, makes a choice at specific plot points, and then watches how their choices unfold. It’s just like—dare I say it?—a visual CYOA book! If you are looking for action, wanting to kick down doors of latent criminals’ homes, and desiring shooting people with a Dominator, keep on walking. It’s not like the choices you make are terribly exciting either; they hinge upon the investigations you are conducting, such as deciding to search a certain location, who you will interrogate first, which team will do what at the crime scene, etc. At first, I was extremely annoyed with how boring the gameplay is. I like reading. I read at least a book a week, but if I want to sit here and read, I’ll go read my current book. However, it didn’t take long for the story to hook me in and make me stress over the choices I was making. If I decide to search the park instead of the library, will I miss the perp? Will he hurt someone? Will I not be able to save him if I make the wrong choice and go to the wrong place? Should I send the other team in to infiltrate, or should I do the infiltrating instead of research? If I was in the world of Psycho-Pass, my Hue would have been a bit cloudy throughout each choice. While it’s not the most exciting gameplay, it has a hook, and the story is incredibly gripping. I was even more impressed with just how many endings there are for each character after looking up the game’s Trophy List. The number of paths Takuma and Nadeshiko can go are incredible. I almost wish this was a true CYOA book, so I could find each ending and read backwards to discover which path went where. Not that I ever did that with those books; I’d never. It could be argued that Psycho-Pass: Mandatory Happiness is not, in a traditional sense, a game, but even so it’s unbelievably entertaining. Story gamers will be in heaven, and fans of the anime are sure to find it just as delightful. I’ve never even seen the anime and I definitely found my own happiness within the stories I experienced. 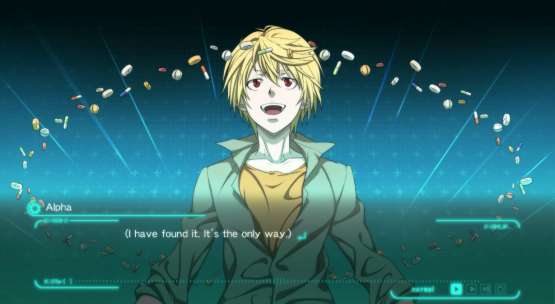 Psycho-Pass: Mandatory Happiness review code provided by publisher. For more information on scoring please see our Review Policy here. Choices really do matter, no matter how trivial they are. Not the most exciting choices. Players could easily get turned off by visual novel presentation.